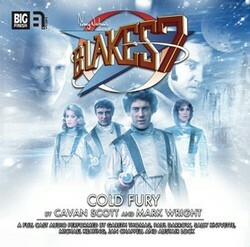 Set in the second season of the Blake's 7 television show, Cold Fury is the fifth episode in the 2014 series of audio plays from Big Finish and sees the Liberator crew head for an ice planet to rescue Vila, who was captured by Travis at the end of the last episode. But there is a lot more going on at Horst Minor than they could have imagined. The 2014 series of full-cast Blake’s 7 audio plays from Big Finish continues with 1.5 Cold Fury, set in the second season of the original television series. The story sees Gareth Thomas return as Roj Blake, Paul Darrow as Kerr Avon, Michael Keating as Vila Restal, Jan Chappell as Cally, Sally Knyvette as Jenna Stannis and Brian Croucher as Travis. Alistair Lock plays the computers Zen and Orac, Hugh Fraser plays the president and Caroline Langrishe plays Dr Tirus. Written by Mark Wright and Cavan Scott, the hour-long adventure picks up where the previous story Mirror left off with Vila held captive by Travis. The crew head for the ice planet Horst Minor to recue him. The planet though also contains a research establishment and Dr Tirus has to deal with an unexpected inspection by the president. Blake though realises that with Travis and the president both on the same planet, there might be an opportunity to do something more important than rescuing Vila. And something important must be going on. Is Cold Fury any good? The interchanges between Travis and Vila are delightful as he interrogates him. Hugh Fraser is extremely believable as the paranoid president. And the story contains a very rare element, the crew using Orac’s predictive abilities to help them. There is some classic dialogue between the crew members that sounds authentic, adding to the realism of the piece. But no sniggering when Jenna says: “It’s too big, Blake.” The one shame is that they didn’t make more use of the environment; too much of the action was inside the base. It would have been interesting for the cold to have had more of an effect. They are though getting good at leaving the action on a cliff hanger ready for the next episode, which in this case is called Caged, and included is a trailer. There are three cast interviews among the extras. The first of these has script editor Justin Richards talking about recapturing the essence of the original series without copying from it, and why they decided on a story arc for this series. Director Ken Bentley adds what he enjoys about the audio plays. The second interview brings in Hugh Fraser, explaining how he sees the role of the president and the scope that the audio environment gives him. The final interview sees writers Mark Wright and Cavan Scott give their take on the changing relationship between Avon and Blake. This ends with a trailer for the Liberator Chronicles Volume Eight, which was also released this month. The issue of Vortex magazine that comes with the download contains an interview with Paul Darrow talking about the Liberator Chronicles, among other things. Recorded at Audio Sorcery and directed by Ken Bentley, the hour-long Cold Fury is available from Big Finish both as a single CD and as a download. Its production code is BFPB7FC006 and its ISBN 978-1-78178-274-3. The music and sound design were by Alistair Lock. The cover art is by Damien May. So, what does the line "It's too big, Blake" actually refer to :)? Big Finish's audio revival of the classic BBC science-fiction series Blake's 7 continues with Mirror, the fourth in the 2014 series of full-cast plays set in the second season. The seventh in the Big Finish series of Blake's Seven audio plays contains three stories featuring Blake, Cally, Avon and Vila.